So why is she in the Timelines exclusive collection? I don't think we saw her dancing in that getup in TOS. The costume, hairdoo, etc are from TOS, but she didn't dance in that episode so I'm guessing that's their Timelines Originalness? That could be it I guess. I haven’t look through my crew yet, but I thought there was a bit of room for artistic license on pose without breaching canon. I'm also surprised by this. Plus the lack of the TNG Mirror cards that weren't included. I was surprised she's in the collection and if she is I can think of a few others that maybe should be too (Agent Janeway [from Killing Game, but Sec 31 and IIRC didn't use an MP40 wearing that costume], Combat Medic Paris [from Killing Game, but was an Infantry Lt., not a medic], Prince Bashir). The Mirror TNG crew weren't created by Timelines staff, so they'd be ineligible. So they should remove Uhura and put in Prince Bashir. I'm surprised Prince Bashir wasn't in the collection since he was a GoT mashup. There actually was a Dancing Uhura, in STV: The Final Frontier. I never bothered to check the costume, but I always thought it was she. The crew in-game is a mashup of a costume from Plato’s Stepchildren with I think a pose from Mudd’s Women. 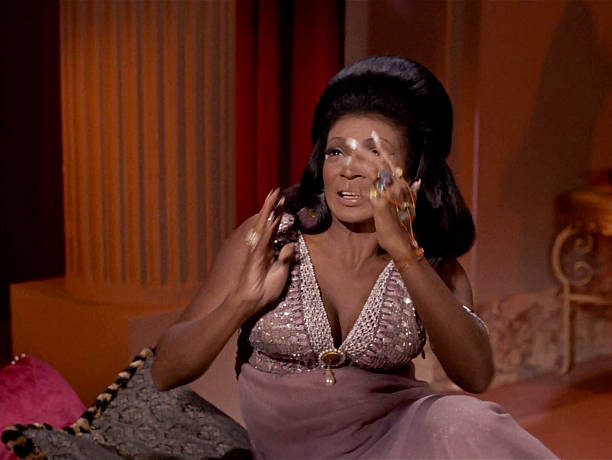 Her dancing scene from TFF not only featured a different costume, Nichelle Nichols was also some 20 years older than she appears in the art for Dancing Uhura. I like the arguments about the pose. It's so silly and you are all so darn cute. A huge portion of the canon characters have custom art showing them in poses that never appeared on screen anywhere. This is done for various reasons, sometimes the pose is taken from a shot that was never fully in frame so they had to work in legs or something. Sometimes it's from a scene with a character seated, but the in-game art has them standing. Lady Beverly for instance never held the parrot. In fact, the bird was never outside of the cage as far as I recall. I don't even think she ever stood in that episode. Mirror Kirk's face is pasted onto "normal" Kirk's body because Mirror Kirk was only really ever briefly seen in the episode and only his face. I could go on, but my point is proven. 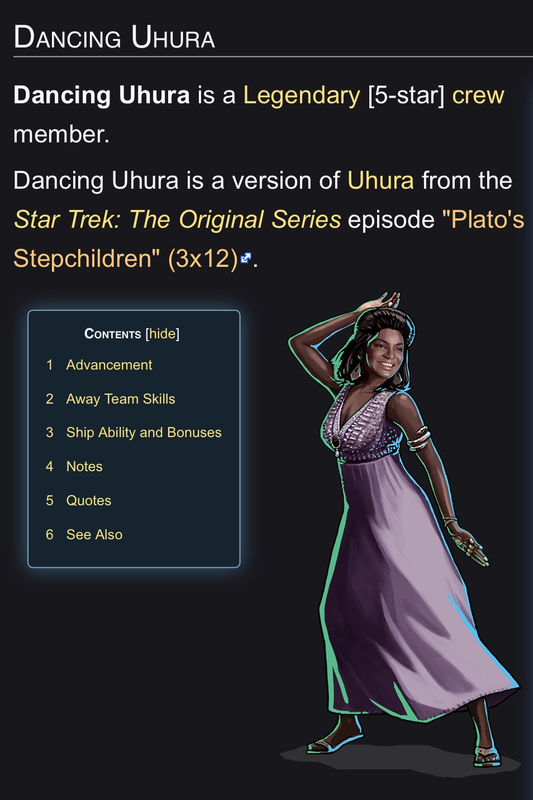 The in-game art doesn't reflect how "original" the character is and Dancing Uhura is not a Timelines original and her inclusion in the collection is in error. Ps. As long as we're on the topic of Uhura, correct me if I'm wrong. Mirror Uhura was never seen on-screen. Only "normal" Uhura posing as Mirror Uhura. Should she be an original character? She clearly existed, but was never seen. Same can be said of the TNG mirror crew. They surely existed in the mirror universe, but since they were never seen on screen, are they cannon? I don't see where anyone was arguing that she should be an "original", only a discussion on how DB might be trying to say she is. I think most generally agree that it's silly she's there.